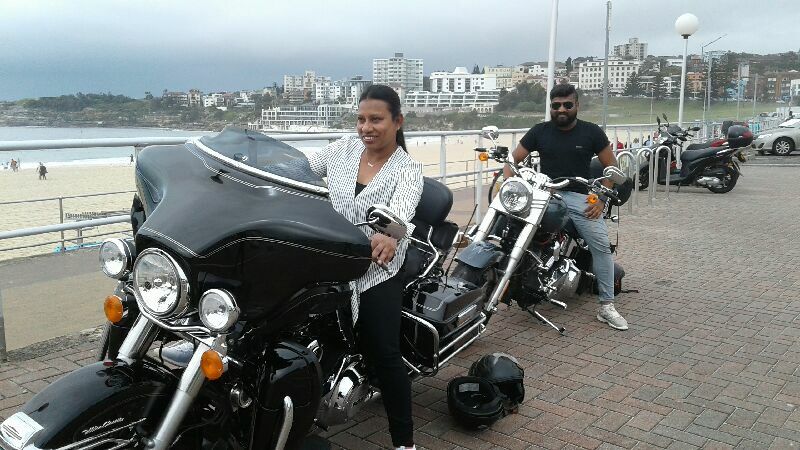 Our passengers are from India and wanted to do a Harley tour Bondi Beach. They own a Harley back at home and agree, it is the best way to see and appreciate a city or country. Jungle and Perry picked them up from the Rose Bay Seaplane. They rode them to Bondi Beach with a stop for photos. They continued through the Eastern Suburbs to Kings Cross and Woolloomooloo. A ride through Sydney city to Darling Harbour where they were going to have some lunch. Even though the weather had dark clouds and a few sprinkles it didn’t dampen anyone’s enthusiasm. 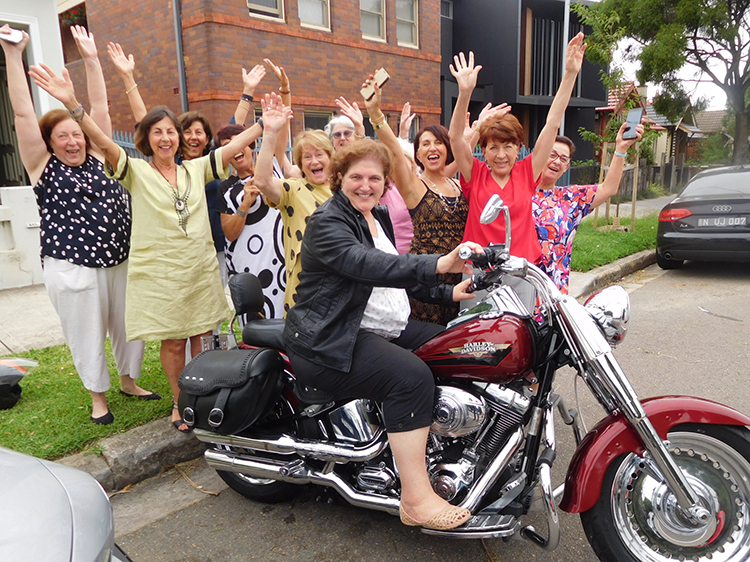 The passengers and the Harley riders all enjoyed the Harley tour Bondi Beach. 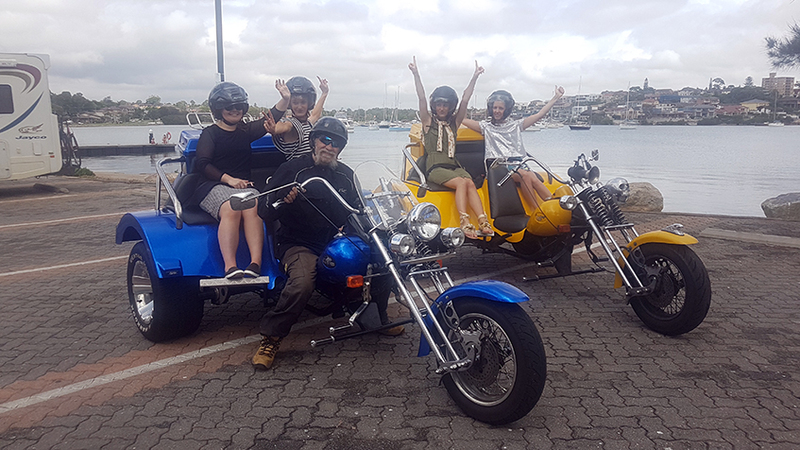 If you’d like to do a Harley tour Bondi Beach or in fact, anywhere around Sydney or the Blue Mountains, please contact us and we can make it happen. Bondi Beach is one of the most popular beaches in Sydney if not Australia. “Bondi” or “Boondi” is an Aborginal word meaning water breaking over rocks or noise of water breaking over rocks. The Australian Museum records that Bondi means place where a fight using boondi sticks (nullas nullas or fighting sticks) took place. Bondi Beach is about 1 kilometre (0.6 mi) long. Surf Life Saving Australia gave different hazard ratings to areas of Bondi Beach in 2004. The northern end has been rated a gentle 4, the southern side is rated as a 7 (10 is the most hazardous) due to a famous rip current known as the “Backpackers’ Rip”. It is near the bus stop and many backpackers and tourists do not realise that the flat, smooth water is a rip, and quite dangerous, and the unwillingness of tourists to walk the length of the beach to safer swimming. The south end of the beach is generally reserved for surfboard riding. Yellow and red flags define safe swimming areas, and visitors are advised to swim between them. There is an underwater but it does not stretch the entire beach, it is made up of overlapping sections. Pods of whales and dolphins have been sighted in the bay during the months of migration (March–May, September–November).Fairy penguins, while uncommon, are sometimes also seen swimming close to shore or amongst surfers in southern line-up. In 2007 the Guiness World Record for the largest swimsuit photo shoot was set at Bondi Beach, with 1,010 women wearing bikinis taking part. Now there is free Wi-Fi to Bondi Beach users. Service is free with limits on access periods and downloads per use.